Posted in General Health & Wellness on July 26, 2009. Last modified on April 02, 2019. Read disclaimer. By the time Labor Day is behind us, summer vacations will be a fading memory and classrooms all across the country will be full. Back at home -- depending on the thoroughness of parents' planning and preparation efforts -- stress levels will be nearing meltdown. The old morning chaos is back: packing lunches, stuffing back-packs with homework agonized over the night before, and then getting everyone appropriately dressed and out the door in time for the: a. carpool, b. schoolbus, or c. the transportation-method-of-the-day. Today's grandparents -- the Baby Boomers and young seniors -- wonder what all the fuss is about. They remember going off to school each fall full of excitement and anticipation. They couldn't wait to meet new friends, to tackle new subjects, and to climb up one more rung on the ladder of life. Well, that was then and this is now… as they say. The changes in the family unit, society as a whole, and in our basic "survival" economics are legion. Today, about one out of two are single parent homes. Single or married, most moms work outside the home, and many face morning and afternoon child care dilemmas. This balancing act often forces choices between earning some much needed extra dollars and quality parenting times. Back when they were in school, today's grandparents might have been warned not to talk to strangers, but -- on average -- just about the worst thing that could happen to them during the school day was failing a test or falling off their bikes. That was before kids took guns and weapons to school… and used them. That was before drugs had found their way into classrooms and cafeterias, and before teenagers got so bored with the world that they took their own lives. These days, the images on the nightly news are scarier than Freddy Kruger, and parents have run out of ways to explain the violence. Today it's not just the kids who are worried sick about safety; their parents are loosing sleep over it, too. So, as the new school year gets underway, there are a lot of unresolved concerns and fears on top of the usual "how do I do what's best for my child/children?" questions. The stress of getting everyone "up and out" is magnified by safety concerns and people of all ages now complain that there's so much to do, and so little time to do it in. While time-management might once have been a necessary proficiency of corporate America, now they're teaching it in elementary schools. (Some schools are even including planners and organizers on the list of basic school supplies!) In fact, a lot of people believe that learning time-management skills at an early age builds self-esteem and gives youngsters a sense of control over their lives. Besides, if parents take the time to pass along these skills, teachers won't have to waste class time on this concept. Kids who have trouble keeping track of their belongings, who are habitually late to class, or who leave their homework at home or in their locker will also have trouble managing their studies. 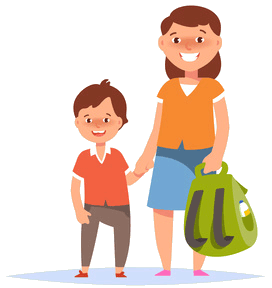 Parents may not be able to stress-proof their youngsters or to isolate them from the senseless violence in the world, but here are some suggestions that might help you get youngsters off on the right track in school. 1. Get childrens' immunizations as recommended. Most schools have entry requirements that include proof of immunization against potentially dangerous -- although now mostly unheard of -- childhood ailments. There are vaccines to prevent Measles, Mumps, Polio, Rubella (German Measles), Whooping Cough (Pertussis), Diphtheria, Tetanus and Hib (Hemophilus Influenzae B, a cause of meningitis), Hepatitis B, and Chickenpox (Varicella). According to The Children's Hospital of Philadelphia, immunizations must begin at birth and most be completed by age two because children under age 5 have not built up the necessary defenses to fight infection, which makes them especially susceptible to disease. A vaccination health record will help you stick to the recommended schedule, and to verify the immunization history when changing physicians or schools. Most parents understand the importance of following the schedule for immunizations, but may not know how vaccines work. Here's the short answer. First, the vaccine -- which contains a weak or dead disease germ -- is administered orally, or by injection. Next the body begins producing antibodies to fight the invading germs. These antibodies have a trial run at the weaker germs so if the real, more potent disease germs come along, the antibodies will be "experienced" in attacking them, and the child will not become ill. These protective antibodies stay in the system, even after the disease is gone, to keep the illness from returning. This is called immunity. If you haven't already done so, schedule a check-up with your child's pediatrician. Make sure all the immunizations are up to date and that you have an accurate record. This might also be a good time to have eyesight and hearing tested. Children who are having trouble seeing or hearing what's going on in the classroom are destined for problems, so it's better to catch -- and remedy -- them early. Are there any medical reasons why a child should not be vaccinated? There are special situations where you'll want to discuss the benefits and possible risks with your doctor before a child in vaccinated. These include if a child has been diagnosed with certain types of cancer or other illnesses, is taking immune suppressing medications or if he or she had a serious reaction to previous shots. 2. Stay healthy. Sometimes this is much easier said than done. 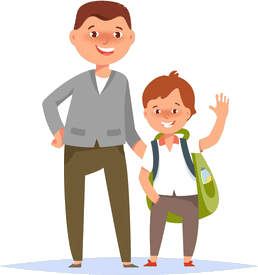 As most parents of school aged youngsters will tell you, during the first few months of their child's school "life" they brought home a lot more than just homework -- like colds, the flu, and other infectious diseases. Parents of kindergartners can expect chicken pox (if they haven't already had it or been immunized against it) and at least one cold or sore throat by the winter holidays. Regular and thorough hand-washings and keeping little fingers away from the nose and mouth can do a lot toward stopping the spread of infection, but these are difficult concepts to get across with all the other new school instructions. Hand-washing and other preventive measures will, however, minimize the spread of germs among family members, and the little ones are quite capable of learning by example. Two more ailments often crop up when kids are first exposed to groups of other youngsters. Pinkeye (conjunctivitis) -- which causes red, itchy eyes, and crusty eyelashes in the morning -- is highly contagious and the most common eye problem among children. The germs can be transmitted by hand to eye contact. Most cases can be treated effectively and quickly with antibiotic drugs or ointment. In most cases, schools will send any suspicious cases of pinkeye home to stay until all the symptoms are gone. The other condition -- head lice -- makes most parents shudder. Before you swear it can't happen to your child, understand that these pesky parasites care nothing about social, economic or ethnic lines, they can and do infest the heads of the very "best" children. In fact, an estimated 6 to 12 million Americans -- most commonly young school children -- are infested with this embarrassing problem each year. The tiny gray bugs are spread when kids share hairbrushes, hats, clothing… even car seats. Condition yourself to get rid of the nits -- as their oval shaped eggs are called -- by using a fine toothed comb and any of a number of non-prescription shampoo lotions to kill eggs and adult lice. To prevent reinfestation, wash bedclothes and clothing in hot water and disinfect combs, brushes and other contaminated items in an anti-lice solution. Routinely check your youngster's head and hair, and insist on frequent shampooing. Experts say that 10 to 15 percent of all school kids complain of repeated bouts of stomach aches. When a cause or infection can't be identified, some stress or underlying emotional worry or concern may be the real culprit. Sometimes chronic ailments -- that only occur on school days, and frequently on Sunday night or Monday morning -- are a child's way of sending a message or asking for assistance with something that's bothering them. Get a medical opinion about the "chronic" illness, ask your child what is wrong, and check with teachers or school counselors to learn if something is bothering the child at school. Once a pattern of staying home for stomachaches gets established, it can be hard to break so this is an issue that calls for firm rules and open conversation to identify the root cause of the problem. Once the schoolyard bully or difficult subject or failing grade is unmasked and talked about, the problem is likely to disappear. There are some symptoms, however, that should always be considered a red flag. If you child has difficulty breathing, any severe pain, a high fever, severe cough, diarrhea or vomiting, or a rash of unknown origin contact your pediatrician at once. Of all the health problems among school-age children, can you guess the most important cause of poor performance and behavior? According to the Chief Medical Consultant of the San Diego Unified School District, the #1 health problem among school children is poor sleep! Most children need at least nine hours a night but many kids are night owls, don't sleep soundly or suffer from breathing issues. A couple other things that research has found to be important for good school performance, behavior and overall health are physical activity and eating a healthy breakfast. Keeping children -- and family members -- healthy amid people who have the flu, colds or other infectious diseases can be a full time job in itself. A healthy home regimen starts with some basic principles: family members should get adequate sleep, eat a balanced diet with plenty of fluids, exercise regularly, and do lots of thorough hand-washing with warm water and soap (antibacterial soap isn't necessary). Catch an illness during the initial stages when its easy to treat. Remember that while viral infections (such as the flu) do not respond to antibiotics, diagnosed bacterial ailments (such as sore (strep) throat) can be promptly and effectively treated by them. Continue to "Helping Kids Succeed in School" Part 2 for What expectations do you have of your child in school?